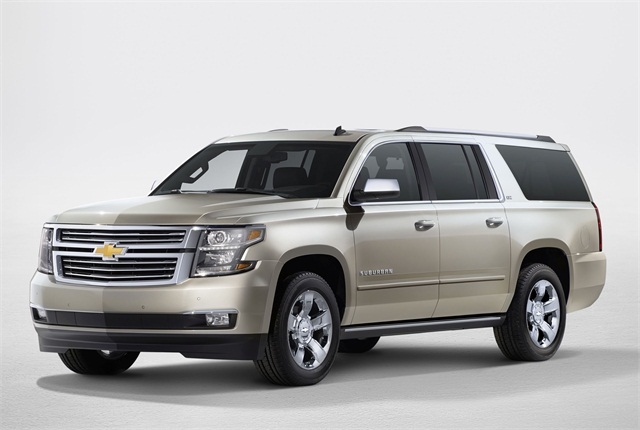 Photo of 2016 Chevrolet Suburban (not Heavy Duty model) courtesy of GM. General Motors is producing its Chevrolet Suburban 3500HD Heavy Duty full-size SUV to federal agencies for use as an unmarked armored federal law enforcement vehicle, the automaker confirmed to Government Fleet. The vehicle is a 1-ton SUV with a purpose-built, full ladder frame that's been engineered for law enforcement and diplomatic security assignments and can accommodate armoring. The vehicle is being exclusively marketed to governmental and commercial fleets, according to a GSA announcement. Federal fleet buyers will have a chance to view the vehicle from 1 to 2:15 p.m. on July 15 at a GSA Vehicle Purchasing event in Washington, D.C. The Suburban 3500HD will be powered by a 6.0-liter V-8 Vortex L96 engine mated to a 6-speed automatic heavy-duty transmission, reported GM Authority. This motor now powers the 2500 HD and 3500 HD variants of the Chevrolet Silverado and GMC Sierra. In other ways, the Suburban will look just like any other Suburban.